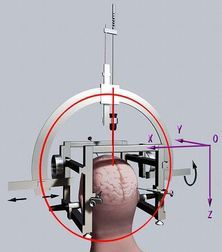 Stereotactic surgery is a surgery in which a system of three- dimensional coordinates is used to locate the site to be operated on. 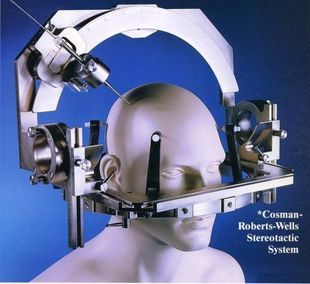 Stereotactic surgery is used in neurosurgery (and neurological research) for locating points within the brain. This is usually done by using an external, three-dimensional frame of reference based on the Cartesian coordinate system. A biopsy is usually required to definitely diagnose a brain tumor. The physician needs to know the tumor type and grade to plan the proper treatment. A biopsy involves removing a piece of the tumor for viewing under a microscope. A biopsy can be performed as part of surgery to remove a brain tumor, or separately. 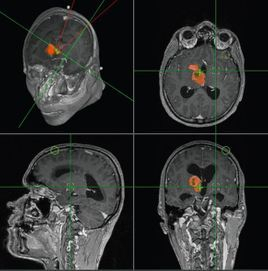 A stereotactic biopsy can be used for brain tumors in hard-to-reach areas. The surgeon drills a small hole into the skull, and, guided by the computer, inserts a thin needle to obtain the tissue. 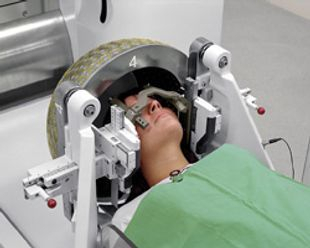 Biopsy is generally performed only for patients with tumors in critical functional portions of the brain, where surgical removal (resection) would result in unacceptable neurologic injury. Minimally Invasive Surgery for Functional Disorders is performed by using CRW frame. Parkinsons disease characterized by progressive increasing stiffness all over body, tremor in limbs with difficulty in walking is no more incurable. These patients can be benefited by stereotactic Neurosurgery. Parkinsons disease usually starts at old age and slowly progresses over a period of time. Tremor and stiffness increases, voice becomes slow, walking becomes more and more difficult and ultimately patient has to lead a totally disabled and bedridden life. Parkinsons disease is caused by imbalance of chemical Dopamine in the brain, which causes overactivity of deep-seated nuclei of brain. 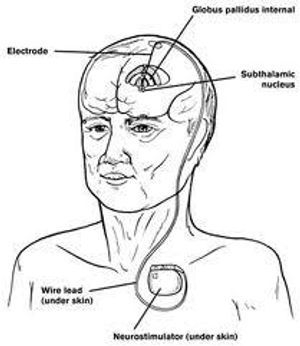 Its surgically treated by implanting a pace maker in Brain known as DBS (Deep Brain Stimulation). Recently we are using stem cell therapy for it. Recently we are also in process of implanting Stem Cells into Substantia Nigra of the brain.